The Complete CenterDrive A-Body Chassis delivered to your door. We install our CenterDrive rear suspension using our jig and ship it to your door. This is perfect for customers who want to upgrade to a fully boxed chassis on their sport coupes or for those want their kit installed on our jig. We can provide the chassis or you can provide a donor chassis. Call for pricing and options. We also build entire cars from the ground up. We can make a chassis designed specifically to your specifications. Want a 350 Chevy in you 50's Mercedes Benz? Are you scared to take you Model A on the freeway? Bring us you chassis and we can put a handle on it. Any make, model or year. Shown to the right is our model A Chassis which is equipped with a C4 Independent Rear Suspension. This chassis also utilizes our Cassette Front Kit and accepts the stock body with no floor modifications. 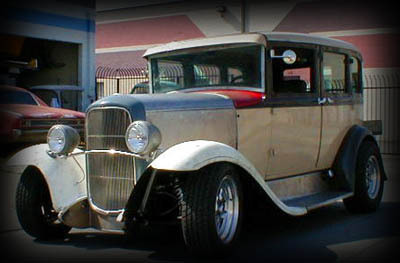 The Model A to the left is equipped with our C4 IRS Chassis. This car rides sweet and low and is fully ready for use on the modern freeway. 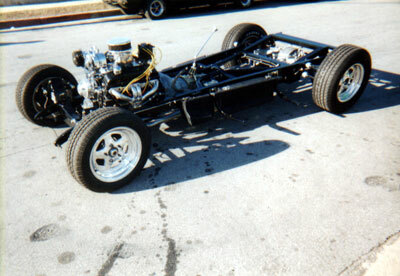 This was originally and El Camino chassis that has been shortened and modified to fit under a Chevelle body. 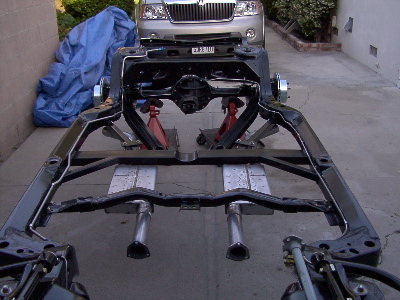 The El Camino chassis has the advantage of being a fully boxed frame and serves to really stiffen the Chevelle platform. This is a chassis for a F-100 that started life as a 3/4 longbed chassis, but has since been shortened and equipped with our CenterDrive Truckarm rear suspension. This is the chassis for a 1955 Nomad that we are currently putting together. It is equipped with our Tri-Five CenterDrive Truckarm suspension. Look from more information on the buildup of this car in the near future.